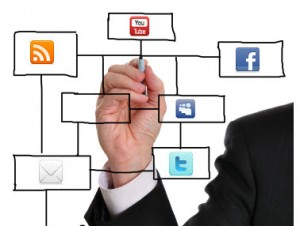 An emerging academic trend I’ve observed recently is the use of social media, particularly Twitter, to crowdsource ideas for university or college courses. This makes a lot of sense to me. In the pre-social media age, we were basically limited to the scholars we knew personally for whose brains we could pick. Now, you can post an appeal for course ideas on Twitter, create a hashtag or access an established one, then watch as the ideas roll in from colleagues and supportive strangers from around the globe. Not all of the ideas will be good ones or compatible with how you want to develop your course, but this is one of those situations when it’s better to have too much of something than too little. I’ve decided to experiment with this method of crowdsourcing ideas for an upcoming course. As mentioned before, I’ll be assuming the position of Assistant Professor of History and Canadian Studies at the University of Maine on January 1, 2016, and one of the first courses that I’m creating is titled “Booms and Busts in North America,” scheduled for the Spring 2016 Term. I envision the course as being an exploration of the consequences of the commodification of nature in the geographic area now known as North America from the 16th century to the present. 1. Looking for some ideas from the Twitterverse re: a course I’m developing titled “Booms and Busts in North America” for winter 2016. 2. It’s a history course, and my plan is to examine the consequences of the commodification of nature in North America post-1500. 3. There will be a particular focus on boom-and-bust economies to make explicit a variety of themes and processes. 4. Want to cover range of geographies and experiences, from fur trade to oil and gas in places like present-day North Dakota and Alberta. 5. Also, I want to move away from simple focus on economic consequences to a more inclusive examination. 6. This would include environmental, political, social, etc. consequences of “resource” extraction and management over time. 7. Sounds like a big undertaking, but I think a series of focused themes and topics could work quite well. 8. It will be a third-year course, so suggestions for readings and topics appropriate for that level would be greatly appreciated. 9. I also plan on putting together a blog post with the suggestions I receive from the Twitterverse. Thanks in advance, folks. A couple of things to point out. First, I didn’t use a hashtag to reach out to a broader community of scholars, since I figured there would be lots of ideas coming in from my existing group of Twitter followers. Second, the course isn’t actually a third-year course, as noted in tweet #8, but a fourth-year one. @Thomas_D_Finger: Have you seen Charles Kindleberger’s book Manias, Panics, and Crashes? As you can see, it’s a short list, but there are some really good ideas here, from general themes to specific sources. I really appreciate @TinaAdcock’s suggestion of Kate Beaton’s “Ducks,” as it fits well with my own interests in comics studies. Nevertheless, I think my first lesson from this experiment might be that using a hashtag could be extremely beneficial. But this part of my experiment, that is, crowdsourcing ideas, is not yet over. I’m still looking for suggestions, so if you have any, please send them along. You can post in the comments section below, send me a tweet (@MarkJMcLaughlin), or contact me via email (markmclaughlin@trentu.ca). And yes, there will be a follow-up blog post in the near future, where I will reflect on the general experience and whether it was worth the effort. Once again, thanks in advance, folks. When I was an undergraduate at the University of New Brunswick in the late 1990s and early 2000s, the name “Acadiensis” always triggered within me a certain sense of awe and wonder. Don’t get me wrong, I was well aware that it was an academic journal, that it published articles on the history of the Atlantic Region, and that it was produced somewhere on the university campus. It was hard not to be aware to some degree. I can’t tell you how many Acadiensis articles I had to read as part of my honours history degree, but it was definitely a lot. Nevertheless, that didn’t stop me or some of my fellow honours students from developing a sort of nerdy reverence for the journal. We viewed, somewhat naively, Acadiensis as a symbol of the craft we were training to join, of both the historians who had come before us and the history that had yet to be written. It also didn’t hurt that the articles in the journal actually made the Atlantic Region’s history interesting, something that many of us hadn’t encountered before that point in our formal educations. It is many years, degrees, and full- and part-time jobs and positions later, and I still have a lot of respect for the journal. Of course, I’m now much less naive about the general operations of an academic journal, but that doesn’t diminish my appreciation for all that Acadiensis has done to bring the history of the Atlantic Region to the fore, as David Frank described so well in a presentation to the Organization of American Historians Annual Meeting in 1999. With the launch of a new blog this past July, along with a new website, Acadiensis has entered the next phase in its mission to promote the history of the Atlantic Region. Much to my delight, I was asked to be a regular contributor to the blog. I accepted, with the understanding that I’ll be writing a few posts per year on a variety of history-related topics. For example, I will soon be assuming the position of Assistant Professor of History and Canadian Studies at the University of Maine, and regularly contributing to the blog is potentially a great way to encourage more cross-border scholarship and understanding in the region. Whatever the topic, this former undergrad, who was once filled with nerdy reverence, is just glad to be a part of it all. For a good introduction to the Acadiensis Blog, click here. To read my first contribution to the blog, a review of Ronald Rees’s New Brunswick: An Illustrated History (Halifax: Nimbus Publishing, 2014), click here. If you’re interested in contributing, contact Corey Slumkoski, the Digital Communications Editor for Acadiensis: corey.slumkoski@msvu.ca. This is a panoramic shot I took one evening last summer looking from a friend’s condominium on the north side of the river at downtown Fredericton on the south side. At this point in its course, the river is close to a kilometre in width, and except for a few weeks during the spring freshet, its flow remains fairly calm throughout the year. As you can see, there is nowhere to take an action shot like the one on the magnet. However, I consulted with a friend of mine who does a lot of recreational kayaking around New Brunswick, and it turns out there are a number of rivers and larger creeks within a half-an-hour drive of Fredericton that have rapids like the ones shown on the magnet. 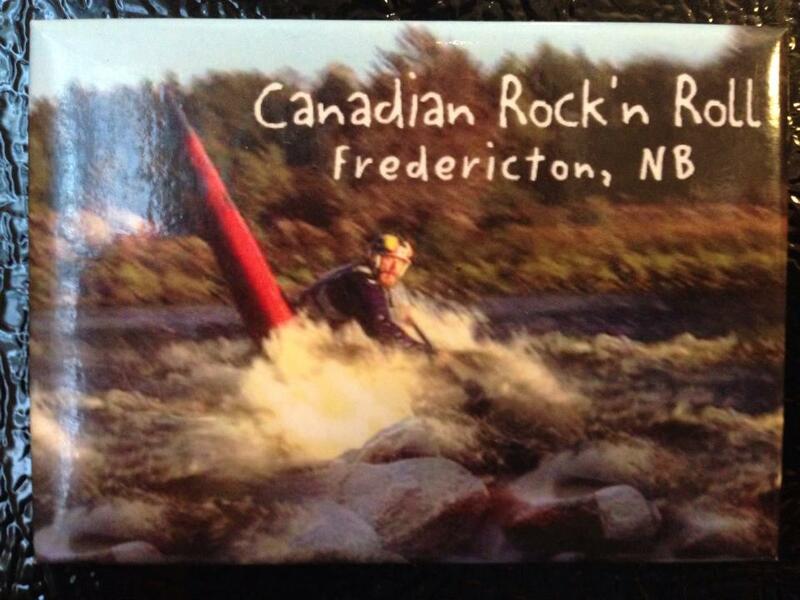 It is thus very likely that the image of the kayaker is an actual photograph taken in the general vicinity of the capital region, and not, as I first believed, the result of some unsuspecting individual filling out an order for promotional magnets with a stock photo. Consequently, the magnet serves as a good reminder of how, as scholars, we need to remain prudent and critically-minded when encountering environmental imagery. While images can be sometimes tricky to interpret, they can also be incredibly powerful analytical tools if we use them wisely. And for the non-scholars out there, images like photographs are referred to as visual culture, and the process of interpreting images is called visual culture analysis. Now I’m far from an expert on such matters, but here are a few basic questions that I’ve found beneficial to keep in mind when conducting an analysis of visual culture: am I reading too little or too much into a particular image? What was the creator’s intention behind it? Is it an accurate representation or misleading, either deliberately or unwittingly? What can be learned from the image in general or from specific parts of it? Does it tell me anything about the time and place in which it was created or about the person/people who created it? First off, some might recognize the image from the front cover of the Winter/Spring 2011 issue of the journal Acadiensis featuring my article on New Brunswick’s spruce budworm spraying program. Outside of my shameless self-promotion, there is the serious intent behind the creation of this photograph. 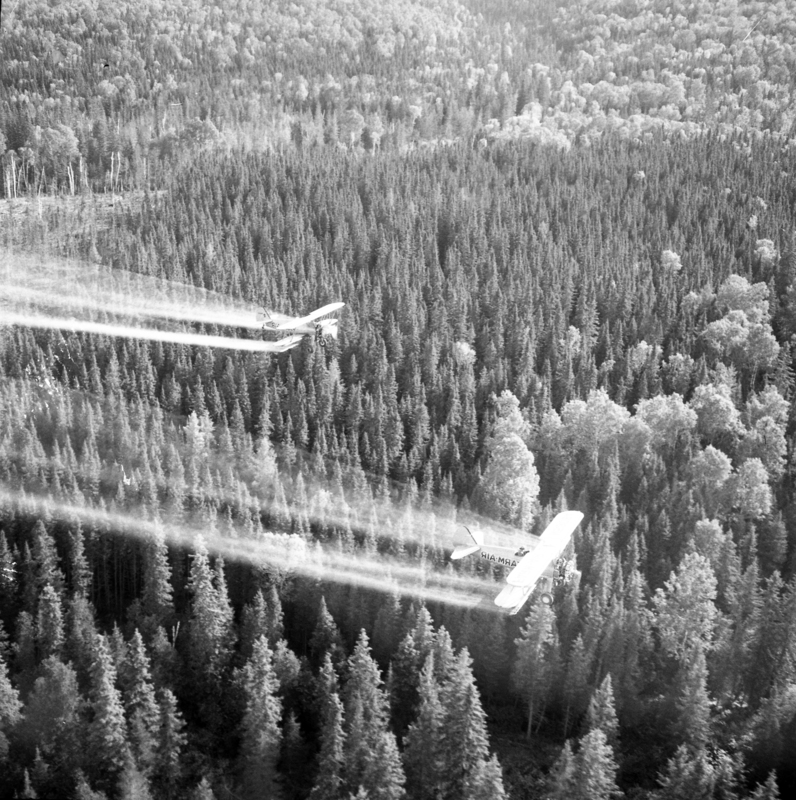 The spruce budworm spraying program was mired in controversy in the 1950s. Conservationists accused the program of, among other things, being haphazardly planned, leading to blanket spraying with little regard for more sensitive areas like waterways. Officials with the public-private company that did the spraying, Forest Protection Limited, wanted to counter any notion that the program was conducted carelessly, so they commissioned a series of photographs to demonstrate that spraying was undertaken in an orderly and controlled manner. Like the one above, many of the photographs were taken from the spotter plane, and depict the spraying operation underway in the typical two-plane formation. The even-aged forests in the background, the outcome of past harvesting, add to the implicit sense of human control over nature. My goal as an environmental historian is to understand the intent behind the photograph and to even move analytically beyond it. Through an examination of the historical record, I worked out that the photograph was in effect a form of corporate propaganda, designed to make the spraying program appear more benign than it actually was. But the image represents so much more than that: scientific and technological hubris, human desperation to keep nature in check, the real fear of what would happen if the budworm wasn’t controlled through the spray option, the concerns of conservationists and environmentalists over the damage being done to ecosystems, the dead and dying fish and birds among the even-aged forests. I’ve used this image quite a bit when lecturing and giving presentations, and believe me, it usually resonates with people on many levels. Whether encountering environmental imagery from the present or the past, there is no perfect, one-size-fits-all approach. The best we can do as scholars is proceed cautiously, ask lots of critical questions, and be open to all sorts of possible answers, yet the rewards can be great. Fortunately, there’s a magnet on the fridge at home to remind me of all of this on a daily basis. Without fail, the first question I’m asked when I explain to people that my academic focus is environmental history is “what is environmental history?” This is a somewhat difficult question to answer, seeing as how environmental historians are constantly debating how to define our field, and sometimes even whether the field actually exists. A fundamental definition would be something like the study of past interactions between humans and non-human nature. Of course, that’s pretty vague, and the easiest way to add some nuance to this definition might be through the use of a visual aid. There’s a short story behind this photo. A few weeks ago, my partner and I went for a hike with some friends in a conservation area near the town of Millbrook, Ontario (information on the conservation area here). After an intense trek on one trail that was covered in poison ivy, we decided to hike along Baxter Creek, where I came across the view pictured above. I thought, “Wow, this would make a great wilderness shot,” and so I took the photo that you see here. The more I reflected, though, the more I realized that it was problematic to think of the photo as a representation of wilderness. The concept of “wilderness” denotes a limited amount of human modification to the landscape, and that was definitely not what we saw on our hike that day. From time immemorial, Indigenous peoples would have interacted with this landscape, and then after the arrival of Europeans, lumbering became a major economic activity in the area, hence the reason the town is called “Millbrook.” Even now, the landscape has been set aside as a conservation area, to be enjoyed by locals and tourists alike, yet there is evidence of human modification everywhere, from boardwalks to trees that have been cut down. In other words, the creation of a landscape that appears wild but easily accessible for hikers. Perhaps what struck me most about the photo were revelations about the pretty flowers in the foreground. 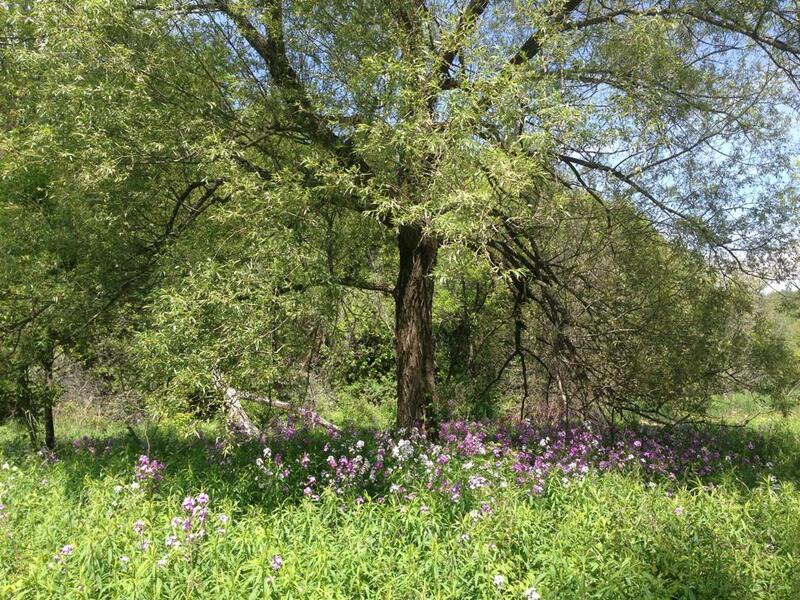 One of my fellow hikers, a friend who works for an environmental organization in Peterborough, identified them as dame’s rocket (Hesperis matronalis). Widely considered to be an invasive species or weed, they were introduced as an ornamental for the benefit of European settlers. Thus, one of the most visually appealing aspects of my so-called wilderness photo is not technically natural to North America. All of the reflecting that I just described was me, in a very basic way, doing environmental history. It’s a way of looking at the landscape around you or in other places, realizing that it hasn’t always just been the way it is now, and working out what sorts of changes the landscape has gone through, and why they occurred, over time. This explanation is still not perfect (believe me, my colleagues will point this out), but hopefully gives you some sense of what it is that we do as environmental historians. So I spent what seemed like an inordinately large amount of time today learning how to set up this website. Why did I bother? Well, I’ll be starting a tenure-track position at the University of Maine in January 2016, and it is my hope that this site will grow with me as I enter the next phase of my career. I’d also like to share my experiences of being a Canadian scholar moving to the United States. I plan on posting regularly on a variety of subjects, from everyday shenanigans, to what’s going on in the classroom, to my latest historical musings. Check back often and see what I’m up to.